Today didn't get off to a good start as I woke up coughing at 5am, thus confirming my fears from yesterday: I was coming down with a cold :( The weather first thing did nothing to help as it was drizzling with cloud on the hills. However once I started walking at 8:15, I started to feel a bit better, although I was slightly apprehensive about the distance I had to cover today. I wandered across the fields, initially bizarrely on a tarmac path, and then along the canal towpath to reach the Pontcysyllte Aqueduct, the world heritage site I eluded to yesterday. The aqueduct was indeed impressive and I was conscious of the long drop down to the River Dee below as I crossed to the far side. I continued to follow the towpath and stopped for a break after around another kilometre on a conveniently located bench. Whilst I was resting the cloud began to clear and soon the sun was out :) My route continued alongside the canal before I double backed on myself to climb up through the fields to cross the A5. It was pleasantly sunny as I walked through the rolling fields full of sheep to reach the edge of the Chirk Castle estate. Unfortunately access to the estate from this side is only possible between April and September, so I had to take the slightly longer route to reach Castle Mill at around 11am. At Castle Mill I stopped for a 20 minute break in the sunshine whilst reading the information boards about the Battle of Crogen in 1165. Soon after crossing the River Ceiriog there was a sign welcoming me to Shropshire; I was now in England for the first time on the Offa's Dyke path. I ascended steeply up the hillside, initially alongside the dyke, but soon I was walking on the very top of it. Around now the first of several showers started and I re-donned my waterproofs for half an hour or so. 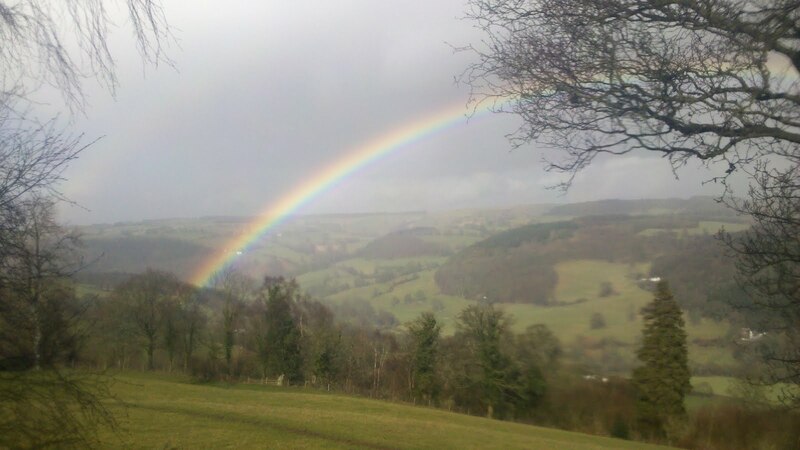 After the shower had cleared there was a spectacular rainbow across the valley. After a further shower, I descended to Craignant and began the sunny ascent of Selattyn Hill. The rain returned as I followed the dyke through the woods to reach Carreg-y-big. From here I followed the road to reach Racecourse Common, where I stopped for a late lunch by the ruins of the grandstand in the sunshine. After lunch, I began to descend through the dark Racecourse Wood, which soon opened out into less dense woodland. At Trefonen I had a break on the village green and studied the map. It was getting late and I still had a reasonable way to go. For some reason the official route makes a big loop out to the west and I realised that I could probably save at least half an hour by just walking south along the road to Porth-y-waen, which actually meant I stayed closer to the dyke than the official route. At Porth-y-waen I rejoined the official route and soon began the steep ascent through the woods to Llanymynech Hill (HuMP). As I was here earlier than expected I decided to try to visit the true summit of the hill. I reckon I got within a few metres of it, but then had to turn back due to impenetrable brambles, hawthorn and gorse. Therefore I settled for the trig point instead before following the path beneath the impressive crags in the fading light. At some point I must have missed a waymark as I emerged onto the A483 a few hundred metres further north than expected. I reached my B&B on the Welsh side of the border village of Llanymynech at 6:30pm. This evening I crossed the border into England, i.e. crossed the road, for dinner and a pint of Black Sheep in one of the local pubs.